Fresh Potato that we offer is widely used for making various delicious food items like chips, fries, etc. We procure Fresh Potato only from trusted cultivators who practice organic farming. Our Fresh Potato is properly cleaned so as to remove dirt and debris usually present on its outer layer. 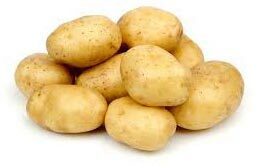 Bulk quantities of our Fresh Potato can be obtained at inexpensive rates from us.